Thursday 18th September 2014 – 10.15am – Claire Brown. A team of ambulance staff from the Black Country are getting ready to embark on a half marathon to raise money for the Birmingham Children’s Hospital next month. 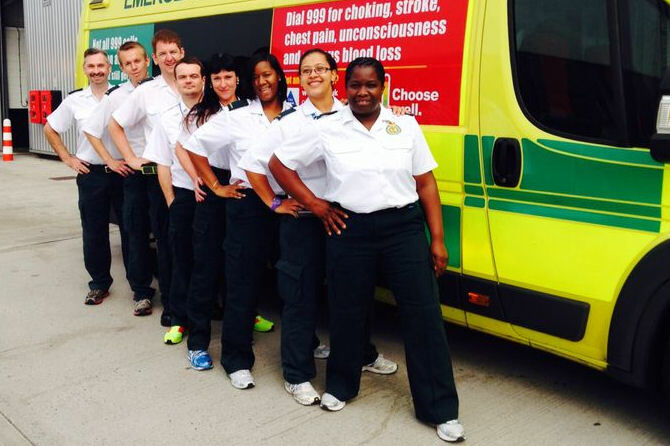 Eight ambulance staff from Willenhall and Dudley Ambulance Hubs together with eight friends and family members will be running in the Bupa Great Birmingham run on the 19th October. The team, who are calling themselves the ‘Humpshire et al Athletic Team’ to recognise the colloquial name for Willenhall, hope to raise money for their fellow NHS colleagues; Birmingham Children’s Hospital. Elisha Miller, a paramedic from Willenhall, said: “Some of us have experience of half and full marathons but quite a few, myself included, have never done any sort of distance running and are complete novices so it’s going to be a challenge! “We’re running to raise funds for Birmingham Children’s Hospital because it’s one that’s close to our hearts as we have colleagues whose children have received treatment there. Pictured (left to right): Walton Seaton, Mark Gibbs, Gaz Perret, Mike Howe, Anna Borecka, Alisha McKenzie, Elisha Miller and Kerlen Gage. Previous Entry Not all strokes are preventable, however, in some case lifestyles changes can help to reduce the risk.